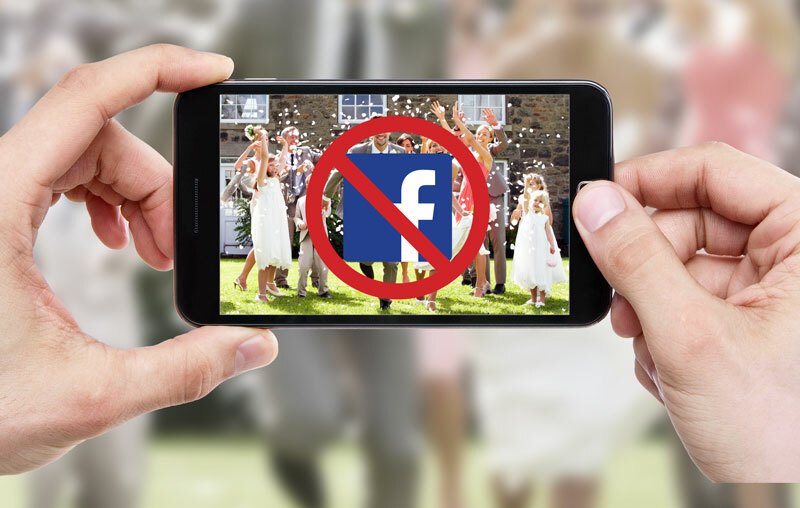 When it comes to the big day, understandably some couples would rather not have pictures of their nuptials spread across Twitter and Facebook, here we will discuss social media etiquette and why it’s not always okay to share the love! You may be wondering what all the fuss is about, but as a guest at a wedding you have to appreciate the amount of time, effort & money that goes into planning a wedding day. The last thing some couples want is to spend a few thousand Euro on a top notch photographer only to see amateur photographs, red eyes included plastered all over social media before they have even said ‘I do’. It is increasingly becoming acceptable to ask guests to leave their phones in the car or have them turned off during the ceremony and we believe the Bride & Groom’s wishes should be adhered to, after all it is THEIR day! So what can the Wedding Scribbler do to help with the situation? Well, here at the Wedding Scribblers we’re seeing an incline in the amount of wedding stationery that includes a message to the guests requesting that photographs be kept off social media sites. We can include a discreet message on any item of wedding stationery, whether that be the invites, save the date cards, wedding information packs or a sign for display outside the ceremony venue. Instagram or not, smartphone photographs just don’t do the bride justice! The couple may not want uninvited guests to see pictures – if they did then you can bet they would have invited them to the wedding! Professional wedding photographers charge upwards of €1,500 because they know exactly what they’re doing. Wedding photographs are special to the couple and there is a good chance they will not want anyone to see images until the have received the ‘official’ photos from the photographer. If a couple makes it clear that they don’t want their most intimate moments Tweeted or shared, then listen to them please! If you are reading this as a guest, then perhaps it’s a good idea to ask the couple that are getting married what their social media policy is. If you’re reading this as part of an intended couple, you should decide on whether you want to have full control over who see’s or reads about every moment of your big day. Remember: Many couples do not want to see pictures plastered across the internet of the back of Uncle Johns head, a red-eyed bride or any other unflattering images. They probably don’t want strangers to read tweets or posts about the venue or bridal party attire either. Respect their wishes for the day and understand that not everyone wants your best friends, cousins, brothers dog, to know all about their big day! Options for Wedding Stationery We are happy to design a sign for your venue, which will notify all guests to please refrain from posting images or details about your big day on social media. We can also include a message on: Wedding invites Save the date cards Table plans & any other item of wedding stationery you desire.